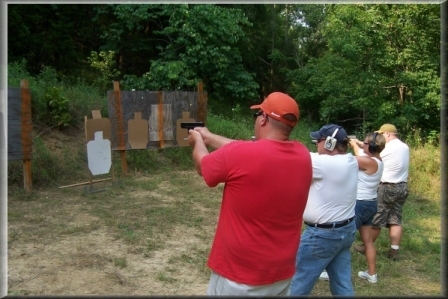 THIS CLASS IS FOR THE STUDENT THAT HAS NEVER SHOT A GUN AND TO HELP YOU SHOOT MORE ACCURATELY. THIS COVERS EVEN THE LITTLE THINGS ABOUT SHOOTING. RECOMMENDED FOR NEW CCDW HOLDERS. YOU WILL NEED TO BRING 200 RDS OF AMMO AND EYE & EAR PROTECTION. THIS CLASS IS APPROX. 8 HOURS, COST IS $85. DISCOUNTS ARE AVAILABLE FOR 2 OR MORE. I ALSO OFFER A 4-HOUR CLASS WITH ONLY THE BASIC SAFETY RULES AND FIREARMS HANDLING. THERE IS NO LIVE SHOOTING IN THE 4-HOUR CLASS. COST IS $45. WILL DO IN-HOME CLASSES. For all courses you will need CCDW license or background check, eye and ear protection, a hip holster, two magazine holders, and at least four magazines. If you have 2 handguns bring them in case one gun breaks down and can't be fixed. If you do not have a backup gun, I will have at least 1 gun that you can use if this happens. You will need to bring a lunch and lots of drinks. 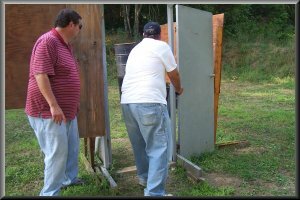 The course introduces you to the fundamentals of modern defensive shooting, handgun familiarization, and safe weapons handling techniques. On the range, we begin with deadly force issues, mindset and personal assessment. Also on the range you will work on ready position, grip, trigger management, and sight alignment. Safety is constantly stressed... You will need approximately 400 rounds of ammo for this course. Begins with a tactical planning and awareness lecture and a review of safety rules. Learn smooth draw, reloading techniques, malfunction clearing, and some shooting on the move. Class concludes with weapon care and maintenance. This class is approximately 8 hours. Mental conditioning and safety are stressed though out the courses. We will start out with reviewing level one--safety rules, etc. 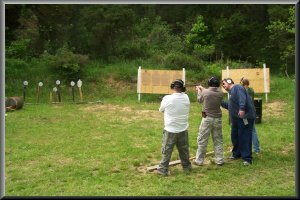 This class adds more movement and off hand shooting, developing your tactical skills with the use of cover and concealment, use of space, and structure clearing. Class culminates with a live fire clearing exercise on shoot/no-shoot decision-making targets. You will need 300 rounds for this course. This class is approximately 7-8 hours. Price for each level is $125 for each student. Discounts are available with 2 students or more. The level 1 and level 2 classes are held in Scott Co.